Pram to play Capsule 10th Birthday! 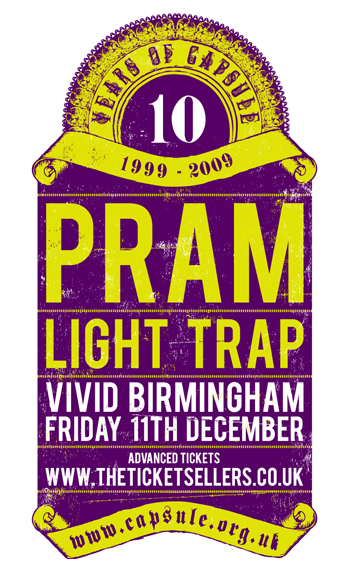 More treats in store for our 10th birthday celebrations – we have just confirmed a show with PRAM and visuals by FILM FICCIONES with support from LIGHT TRAP. Capsule are overjoyed to include these guys, we have had a long standing relationship with PRAM from an early commission with VIVID for the first ever Supersonic Festival back in 2003, to our showcase at Sonar Festival in Barcelona and our event as part of the launch of Town Hall Birmingham to name but a few spectacular events. They will be joined by Light Trap, a trio from Birmingham, England comprised of John (Haxan, ex Doom & Sore Throat and of course Brummie Of The Year 2008), Doug (Una Corda) and Nic (ex Napalm Death & Scorn). They combine blackened and primitive noise rock with progressive and experimental elements. This show also takes place at Vivid expect mesmerising visuals courtesy of FILM FICCIONES.